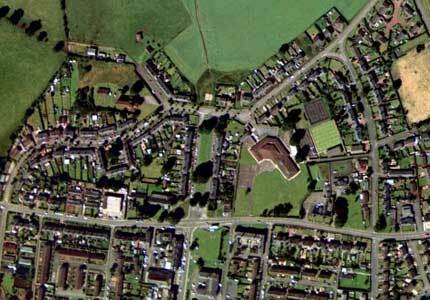 Our current work on a masterplan for Gretna has brought us into contact with the work of Raymond Unwin. Unwin set out a plan for the development of Gretna early in World War I as a new settlement to house the considerable number of workers in the munitions factory that had been developed nearby on the Solway Firth. In Gretna today, only a few streets and buildings are attributed to Unwin and his partner C M Crickmer but these have a special character and quality that mark them out from the rest of the town. Some of the characteristics of these areas include broad tree-lined streets with narrow roadways and grass verges, generous gardens and brick housing – either terraced or four-in-a-block – with shallow plans and long frontages. The area is laid out in a winding picturesque pattern of streets focusing on set-pieces including a church and a formal park. It is so obvious that these areas are the work of a skilled hand with a particular attitude to building towns – it is more than just architecture. Some of the pages from this book are available on Google Books. The few streets of Unwin’s work in Gretna amply demonstrate how he was able to turn principle into practice – as he was able to do conspicuously in Hampstead Garden Suburb above. They also sit very comfortable in the 21st century – they are safe and walkable, they keep traffic in check, they have generous private and public open spaces together with well placed centres and focal points. Raymond Unwin and Gretna is a fascinating story of early 20th century town planning. It has provided us with excellent examples of how to create new neighbourhoods and has given Gretna a worthy pattern for extension and new building. Link to more information about Unwin and planning in practice. Link to previous post about the Gretna Masterplan commission.